Go To "System DSN" Tab>> select QuickBooks Data>> click "configure"
Switch to activate/deactivate tab >> click "deactivate"
Enter your 16-digit CDKEY (with the - dashes) and click on the Deactivate button. Note: Phone (Manual) Deactivation can be used for computers that do not have direct Internet access or where the automated deactivation fails. 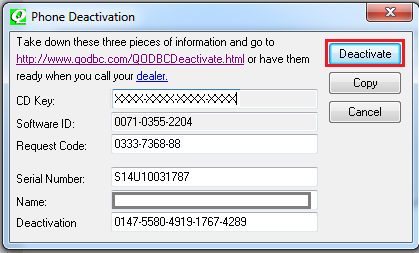 Copy the information from your computer screen (not the example shown here) into the image directly below and click on Process to generate a code to deactivate QODBC. Click on the Copy Information to the Clipboard button to save your CDKEY. 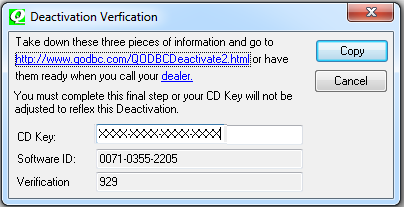 If you have correctly entered your CDKEY, Request Code, and Software ID, your deactivation will now be processed. 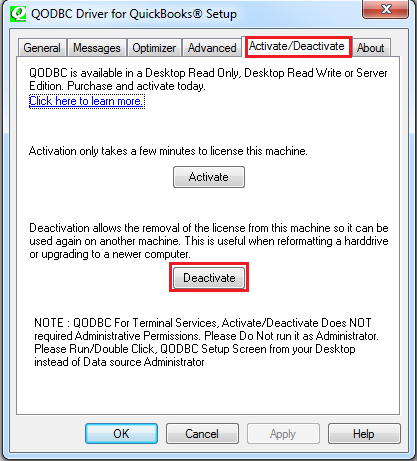 Click on the Phone button on the computer that has QODBC installed on it and copy and enter your Serial Number, Name, Request Code and Deactivation Code from the above image and click on the Deactivate button when done. If you have entered the information incorrectly, you will receive a "CDKEY not found" message. Clicking on the Deactivate button will generate a verification number. 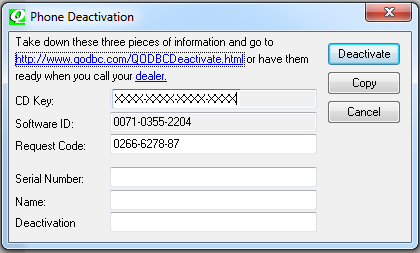 Copy the information from your computer screen (not the example shown here) into the image directly below and click on Process to confirm your deactivation of QODBC. Once you process your verification number, your copy of QODBC will then be successfully deactivated on your computer so that you can transfer the license to your new computer! 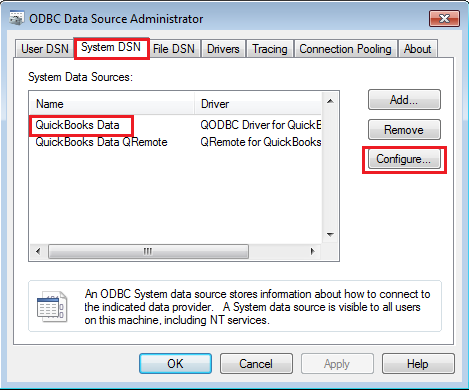 See: How to activate QODBC to activate the license on your new computer. 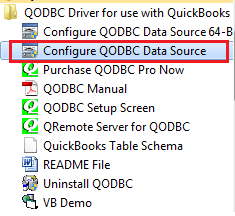 Click Cancel to exit the QODBC Setup screen. Note: Your deactivation may take 24 to 48 hours to process depending on your region and license pack. I don't want to deactivate the other computer because we need 2 systems running. Doesn't mean that I must repurchase another license or is there another option. QODBC is licensed to each computer. When you purchase a single-user license, you are licensed to use the product on one computer only. If you need to run two computers, you need to purchase another copy. For contact information click here. How do I move the license from one server to another? I deactivated on one computer and then attempted to activate it on another machine however I am told that the CDKey has been used already. Now what?